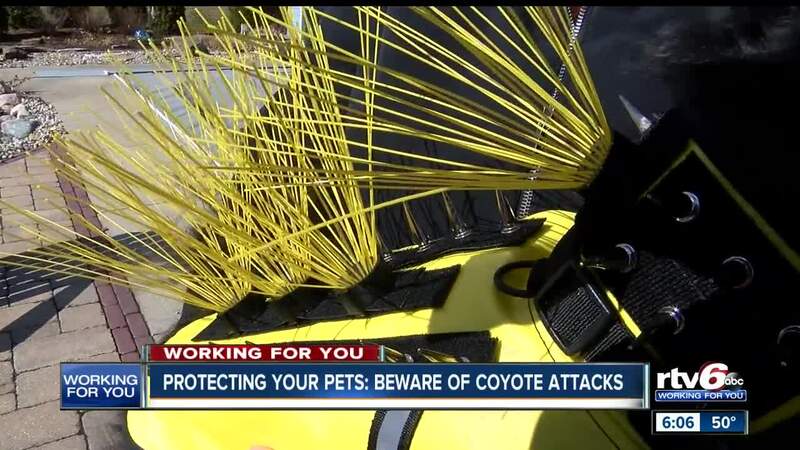 Protecting your pets: Beware of coyote attacks. BROWNSBURG — Marcia Soder bought a vest called "coyote whiskers" to better protect her Pomeranian, Ebby. It's used to protect pets from coyotes. The Brownsburg woman bought the vest for Ebby after a coyote attacked him in their back yard. "We saw blood clots on his fur, so I gave him a bath, and he had over ten puncture wounds on him," Soder said. And this wasn't the first time, she said. Another one of their dogs, a 99-pound golden retriever, had been attacked by a coyote right outside of their home, as well. "There were two coyotes," Soder said. "I actually saw that occur in the back yard and I went out like a mad woman with a broom chasing the coyotes away." The Department of Natural Resources said it's hard to say whether or not the coyote population is necessarily growing; they haven't conducted a study recently. But they do know more and more people in Indiana now live in subdivisions. "We live in a subdivision, and we have coyotes and foxes and deer," Soder said. "I have seen coyotes even in downtown Indianapolis. So I think we just need to protect our animals if you're going to have a pet." Coyotes love to hang out around the perimeters of neighborhoods. Because of that, people are now more likely to see them. With their orange and gray fur, the look of a medium-sized dog, and bushy black-tipped tails that can help distinguish them from other animals. DNR said do not store pet food outside or leave it out overnight. Avoid keeping trash outside, as well. If you have too, cover it with a lid. Also, do not feed wildlife - including birds. Rodents - which are coyotes natural prey - are attracted to birdseed.